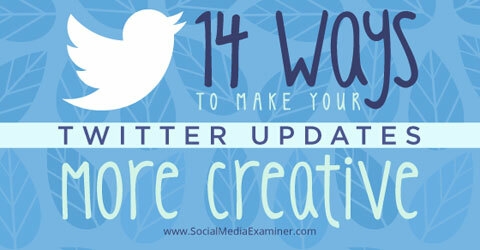 Find 14 ways to publish more creative Twitter updates. Tweet out a straightforward question that’s easy to answer and you’ll likely see a jump in engagement. When questions are short and simple, it’s easy for followers to respond because they don’t need to spend a lot of time thinking about their answer or trying to fit a longer reply into 140 characters (or fewer if there’s a hashtag). 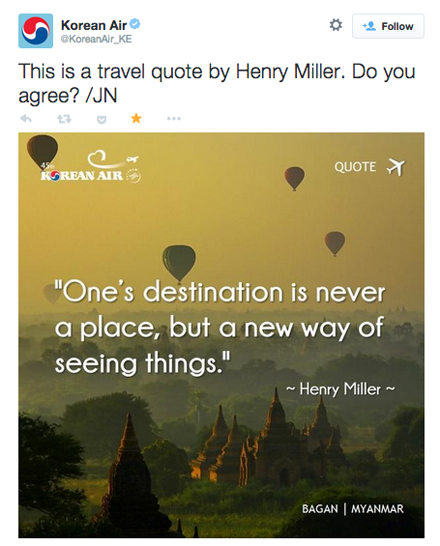 Fill-in-the-blank tweets get your followers thinking and challenge to them to show their creative side. The key to making fill-in-the-blank tweets work for your company is tomake them relatable to your followers’ interests. Another option is to ask followers to choose between two things. For example, ask Instagram or Pinterest? Cookies or chips? Coffee or tea? You get the idea. Asking fans to pick one or the other is a quick way to get retweets. To reach an even wider audience—and gain more engagement—ask your fans to retweet if they like the first choice or favorite the tweet if they like the second choice. While you want to mix things up, it’s definitely OK to tweet about your products. It’s one of the main reasons you registered a Twitter account, right? The problem is that people see products everywhere! To break through the noise, stay away from simply posting a corporate photo of your product. Instead, think about how you can include your product in different scenarios. Imagine what your product looks like in real life, how people use it, where they put it, etc. 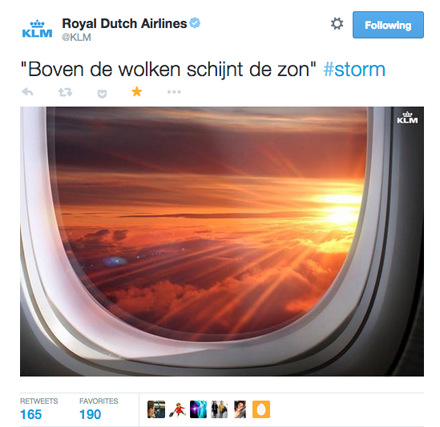 Be creative and add different perspectives of your product on Twitter. Take the opportunity to be creative and add perspective to your product. Twitter is a very human platform, so you will need to adapt your product photos. Did you know Twitter allows you to tweet rich media? People sometimes forget they can share video on Twitter. What I love about video on Twitter is that followers can watch without leaving the platform. 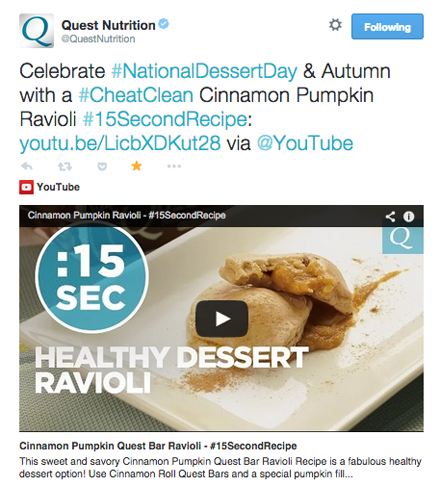 Users can watch videos without leaving Twitter. Videos are a good way to share your thoughts on a topic, give followers a behind-the-scenes look at your company or present a short product tutorial. They’re also a great way to launch a new product. It can be hard to convey meaty content in 140 characters. Sharing slides solves that problem. Now you can tackle just about any topic and spur conversation. And since your followers don’t have to leave Twitter to view your slides, it’s easy for them to comment or retweet after they’ve gone through your deck. Deeper conversations are a great way to build relationships. 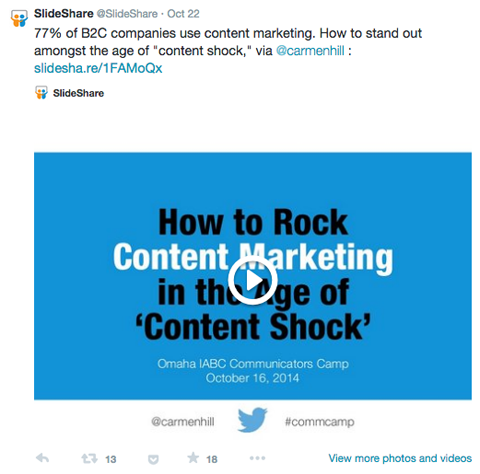 Your followers can go through your SlideShares without leaving Twitter. What kind of slides should you share? The options are endless. 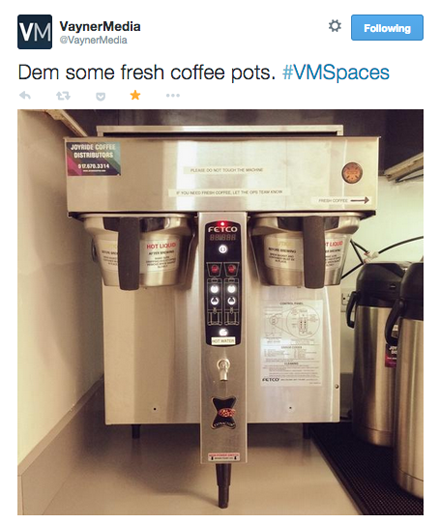 Let’s say you’re a new cafe that takes pride in how you make your coffee. You could create a beautiful slide deck about how to brew that perfect latte, what beans you use and why you heat your milk to 140° instead of that tongue-burning 158°. How did I come up with that example? I’m pretty sure I read a slide about it! Retweeting public accolades from real customers provides social proof for you. Those reviews and testimonials help you build trust and help prospects overcome any skepticism they may have. Retweeting your followers’ testimonial tweets helps build trust. One thing I like about retweeting testimonials is that it shows that you’re paying attention to your customers and appreciate their compliments and contributions. Sharing is caring! Retweeting is one of the easiest ways to update and it benefits both parties involved: You create relationships and they’re exposed to a wider audience. Twitter has become a major source for staying current with news and trends. In fact, many people rely on Twitter for their news updates (including me). If you’re the one providing that news or retweeting it, people begin to view you as an important resource. Sharing useful content helps you build credibility. There’s no Twitter algorithm to control how links and news appear in your Twitter stream, so the faster you can provide news or event updates, the better. Do you have recurring thoughts about a topic? Do you have ideas about your industry? Share them with your followers. You’ll be surprised how many of your followers have the same thoughts as well. Sharing your thoughts is an effective way to spark conversations with your followers and build a connection with them. 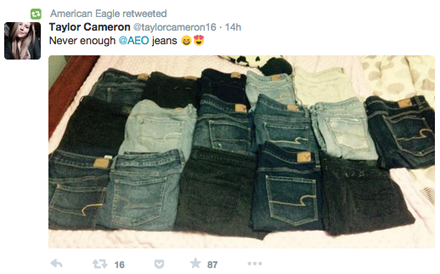 More brands are adopting the trend of giving fans a behind-the-scenes look at their company. It provides transparency and gives an authentic voice to your business. Behind-the-scenes is a great way to humanize your business. You can easily use this idea yourself, and if you’re launching a new product, this tactic can be especially useful. Giving your followers a sneak peek of a new product or event that’s coming up keeps followers on their toes and makes them feel like they’re a part of your inner circle. Have you live-tweeted before? It’s fast-paced and fun. It allows your followers to be a part of what’s happening in real time. You can live-tweet anything that would interest your followers. It can be a niche-related conference or even a popular show or event (e.g., the Grammy Awards or the Super Bowl). Just be sure to use the appropriate hashtag (check that sidebar again to see what people are using). If you’re live-tweeting something like the Super Bowl, there’s a good chance your fans are tweeting it too, so you’ll be sure to be part of the conversation. In fact, if the event hashtag is trending, you’ll be reaching an even larger audience. Not bad. Quotes are always popular no matter what social media platform you’re on. The reason people like them so much is that they’re often general enough to relate to a wide audience. Quotes are popular on most social media platforms. You may have noticed quite a few people posting motivational quotes. Fans definitely respond to those, but you don’t have to limit yourself. Try posting quotes from your favorite books, TV shows or blog posts. A meme is a popular image paired with a funny phrase. They’re great to share because readers respond well to visual content and like a little humor in their Twitter stream. It’s not unheard of for a funny meme to go viral. A fun meme can easily spread on Twitter. It’s fairly easy to find popular memes, but it’s even better to create an original meme that fits with your company or product. That way you can entertain your followers while subtly promoting your product or service. Consistently posting helpful daily or weekly tips keeps your audience coming back, and the tips aren’t too hard to come up with. Consider these questions as a starting place: What is a little-known feature of your product or service? How can using your product add value to followers’ lives? What problems does your product or service solve and how? Use those answers to come up with a tip that can fit into about 100 characters(so you can include a hashtag and leave room for any commentary a fan wants to add to a retweet). Since your tips are short, they’re digestible and easy to retweet. Hashjacking (also known as trendjacking) is when you use popular hashtags within your own tweets in order to gain extra exposure. You can find trending hashtags on the left side of your profile. Pay particular attention to those that are trending in your area or country. Knowing which topics are hot allows you to tailor your content to match both your company message and the hashtag so you can jump into the conversation. Using trending hashtags can get your tweets extra exposure. But before you use this tactic, there are two things you need to know. First, research the hashtag and the conversation around it. 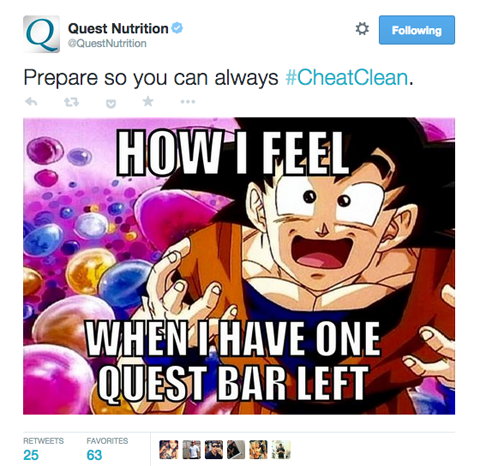 Second, make sure the hashtag (and conversation) matches your brand image. 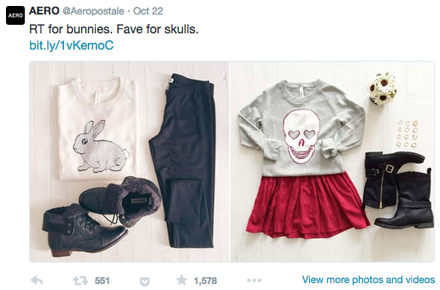 These tips are important because some brands jump the gun and use hashtags that are inappropriate. That mistake can create an extremely embarrassing moment for your brand and you may end up with damaging backlash. Personal tweets are about your business, while promotional tweets are about your products or services. Tweets that fall under purpose are those that add value for your fans. Each of the ideas I’ve shared here falls under one of those categories. Use them as stepping-stones to grow your tweet catalog and increase your follower count and engagement.